I found a digital scan of this photo on War Relics Forum, a site dedicated to WWII artifact research. The OP of this photo, MD Helmets, doesn’t have any additional information but did claim he/she purchased it from Bay State Militaria back in 2013. What do you guys think? Any leads? After owning this photo for over a year, I decided to reexamine the image in hopes of properly identifying the sitter. 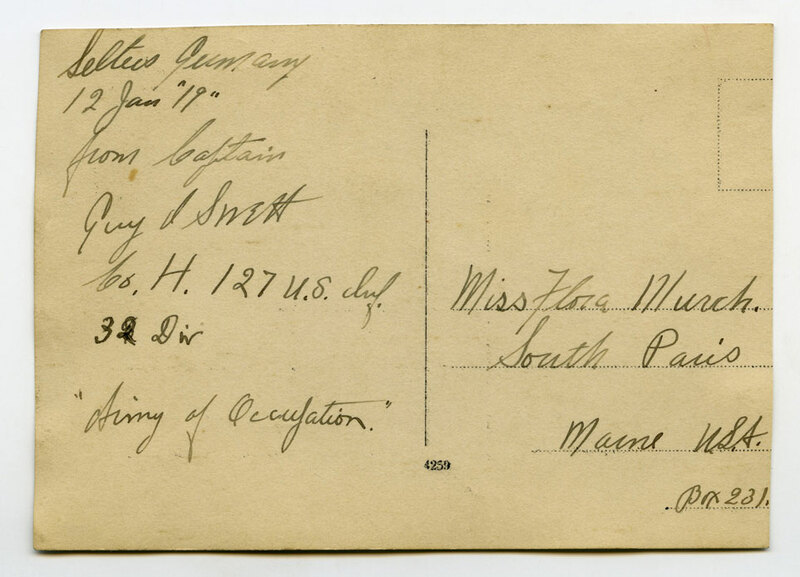 The front is inscribed ” Oh for Some Ice Cream!” with a partial ID of F Draper Hu….. with the surname clipped away. 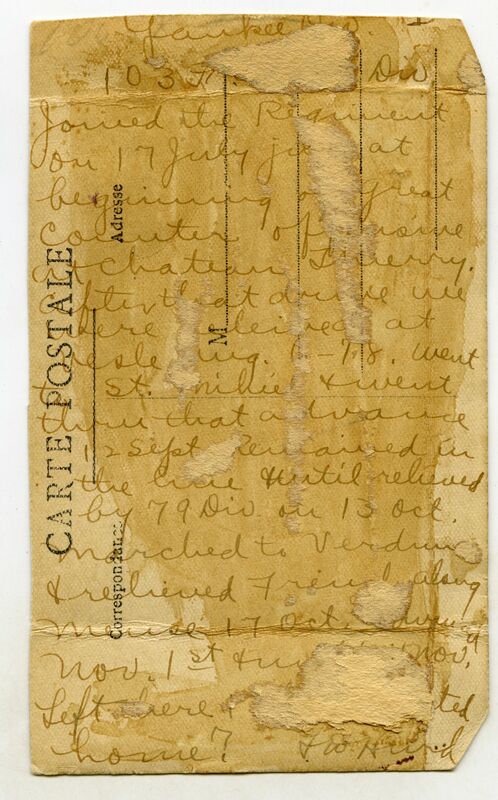 The reverse proved juicy for wartime information, giving some additional information placing the Lt. as being present during the Yankee Division’s experiences at Chateau Thierry, St. Mihiel and Verdun. His name was partially obscured by remnant scrapbook paper. After steaming the affected section with heated and distilled water, the glue separated the paper from the photo and revealed his full name. 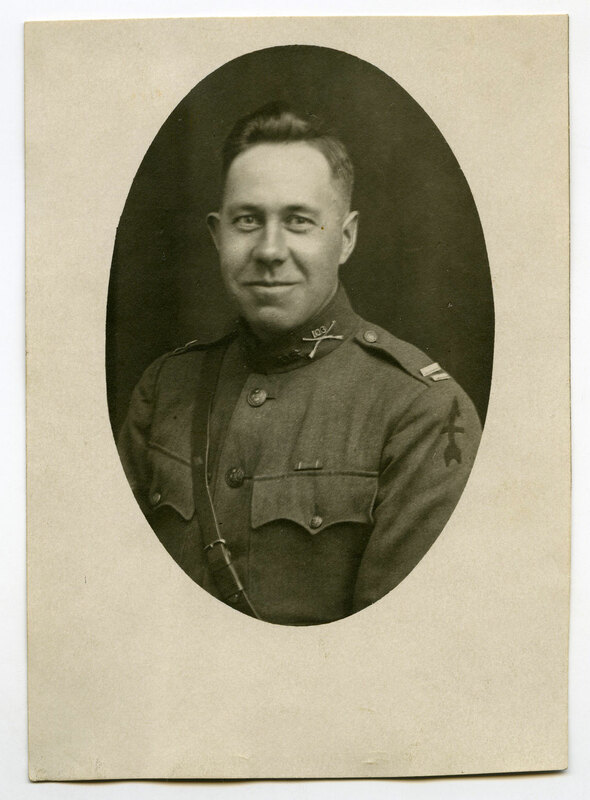 Fritz Draper Hurd was born in Williamsport, Maryland in 1894 and attended Pennsylvania College as a member of the class of 1916 but sadly was expelled the night before graduation after a graduation party involving drinking and furniture breaking. A dejected Hurd left home and went to Philadelphia seeking work, eventually landing a job with the Eddystone Remington Arms Company turning out components for the lend-lease British Enfield rifle. 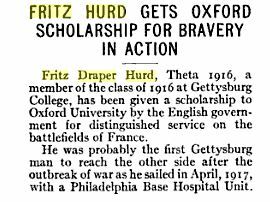 After hearing of the US declaration of war on Germany, Hurd signed up with a Philly based Red Cross ambulance unit and went overseas in May of 1917 eventually landing in England. 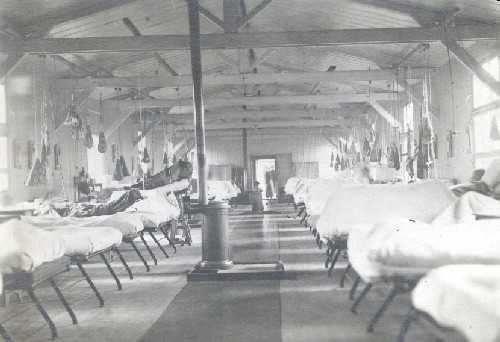 After a quick training he was sent to France to serve as a nurse with Base Hospital #10 – a British hospital for badly wounded soldiers. The initial wave of Pennsylvania men and women was comprised of 23 doctors and 64 nurses – the first Philadelphia body of organized soldiers to leave Philly. 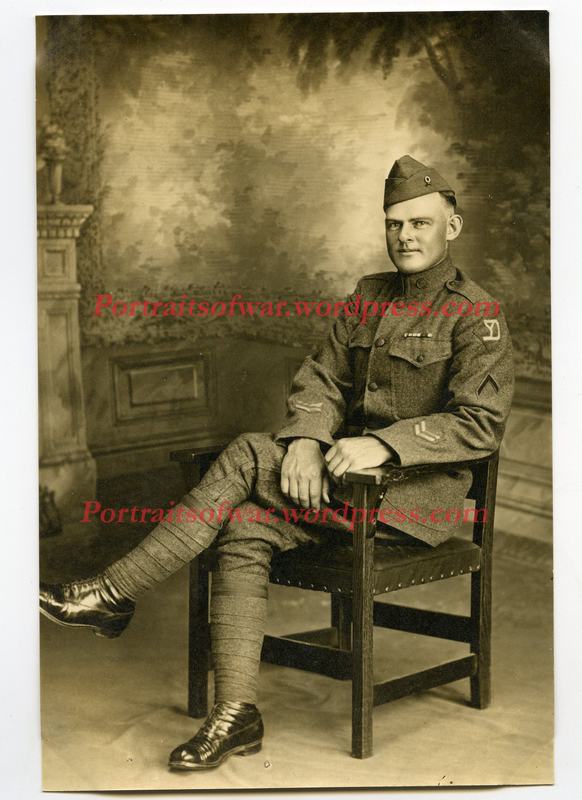 He next attended Field Artillery School and commissioned a Lt. with the 103rd Field Artillery Regiment, a unit of the 26th “Yankee Division”. The photo shown above depicts Hurd wearing a uniform with insignia related to this period of his wartime career. 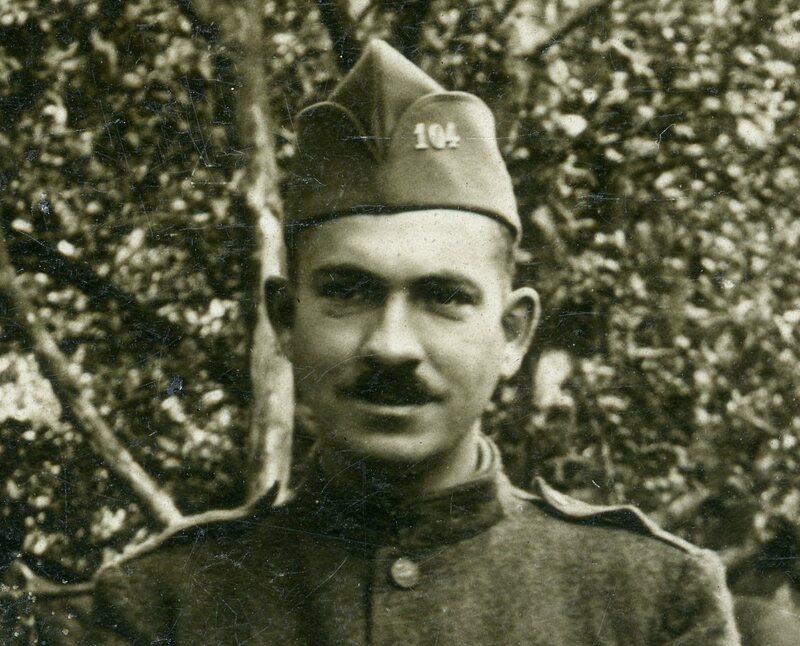 During his time as an artillery liason between the 103rd and the front line infantry units, Hurd was responsible for lugging a wire spool and calling in artillery fire. He also spent some time in an observation balloon and is credited for calling in a barrage that took out three German machine gun nests. He also is documented as being a participant of the last artillery shot of the war- firing only minutes before the official end of the war. He was able to attend Oxford after the war and later became a distinguished medical profession back in the US. He lived well into his 80s and recorded a memoir which can be found in the Special Collections department of Gettysburg College along with his wartime diary, knuckle duster trench knife, musette bag, scrapbook and assorted ephemera. 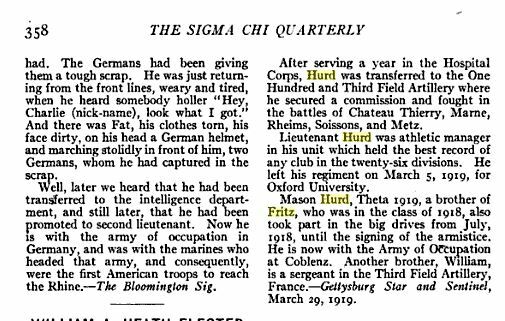 Johnson, Sarah M. Growing up in the Trenches: Fritz Draper and the Great War. Diss. Gettysburg College, 2013. N.p. : n.p., n.d. Print. A nice selection of Yankee Division portrait photos to add to my growing collection! 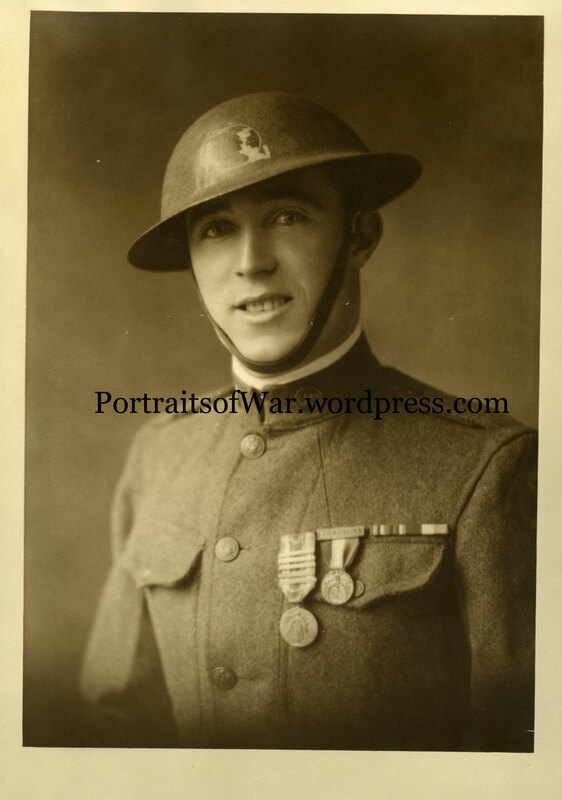 An incredible set of three photos of a 101st Field Artillery doughboy wearing his helmet with painted unit insignia as well as his town medals and victory ribbon with multiple clasps. Also included is a shot of an engineer officer with the division. My search for WWI Vermont photography continued this week at the University of Vermont’s Special Collections Annex. 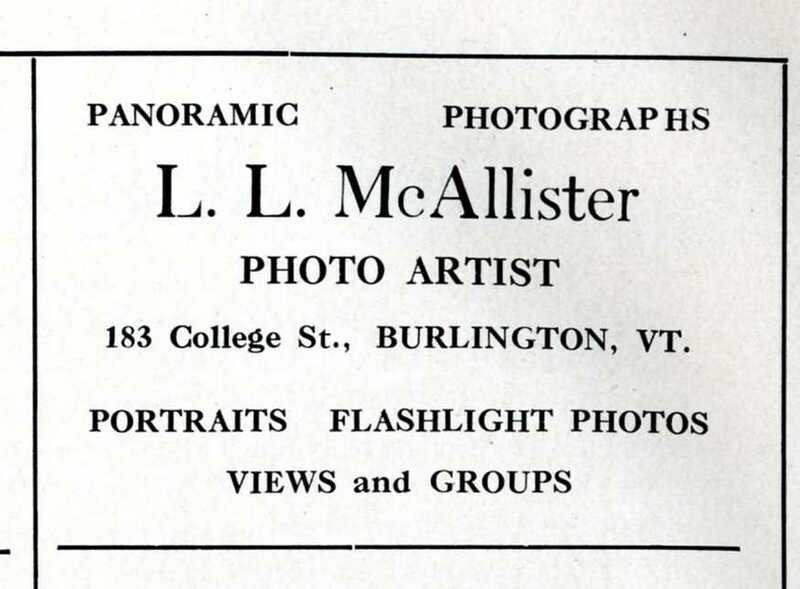 Utilizing the Louis McAllister Collection database, I was able to track down two panoramic photographs taken at UVM in 1918. This particular shot was taken in front of Williams Science Hall located on the UVM green. I spent much of my time as an undergraduate studying in this building, so this photograph is particularly close to my heart. This first photo was taken by McAllister on October 31st, 1918. The new class of the S.A.T.C. was just inducted on October 23rd, just a week before this photo was taken. Although the quality of the image is lacking, the content speaks volumes. The second photo was taken a few months earlier, in July of 1918, and shows the first round of students from UVM to be drafted. McAllister enjoyed using the Williams Hall entrance as a backdrop for his photographs; this is a panoramic style we see until the early 1960s. While searching for reference material, I came across this advertisement from the 1918 Ariel yearbook of UVM. It looks like Louis McAllister was a supporter of UVM! Special thanks to the UVM Special Collections crew for helping me with my search. All photos in this post are courtesy of UVM Special Collections. Today’s photo post is a real head-scratcher! 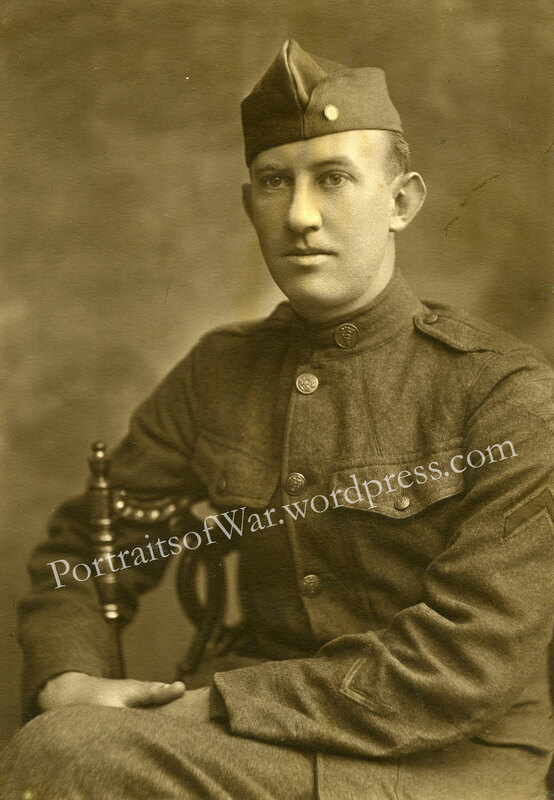 I purchased the image thinking it was a nice studio portrait of a 32nd Division officer, which is evident from the SSI patch of the red arrow with a line through it. 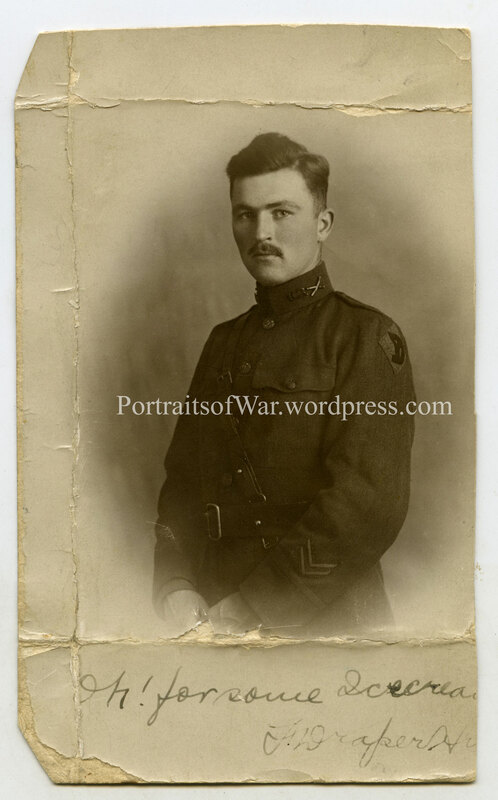 When the photo arrived I noticed instantly that the officer was wearing the collar insignia of the 103rd Infantry Regiment of the 26th Division. 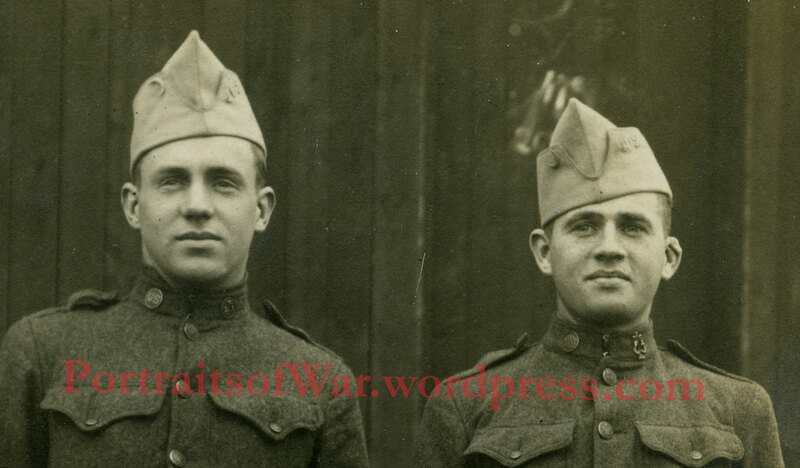 Causal readers of this blog will know that I actively seek out 26th Division photos due to my New Englander roots. I am assuming the fellow was originally from the South Paris area in Maine, which would point towards a Yankee Division identification. The 32nd Division was made up of guys from the Michigan area. 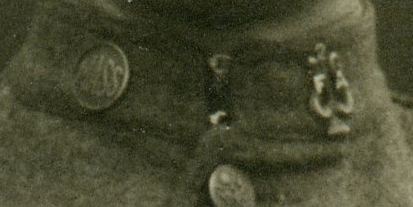 Looking at his other insignia also may point to his unit identity. Is that a DSC ribbon on his chest? It’s hard to tell, but it possibly may help in identifying the last name and original unit. Any help from readers would be greatly appreciated! Special thanks to our friends over at Soldier’s Mail for this wonderful interpretation! Don’t forget to check out their website for a super collection of WWII related information. After the Armistice, the 26th Division was in such bad shape from combat losses that it was assigned to the rear rather than the Army of Occupation. However, a number of its members chose to extend their deployments and were reassigned to different units in other Divisions stationed in Germany. 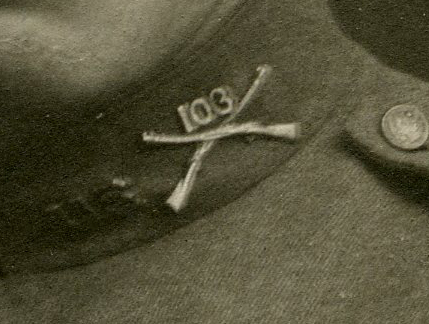 The officer in this photo clearly originated with the 103rd Infantry as indicated by the Regimental device on his collar. 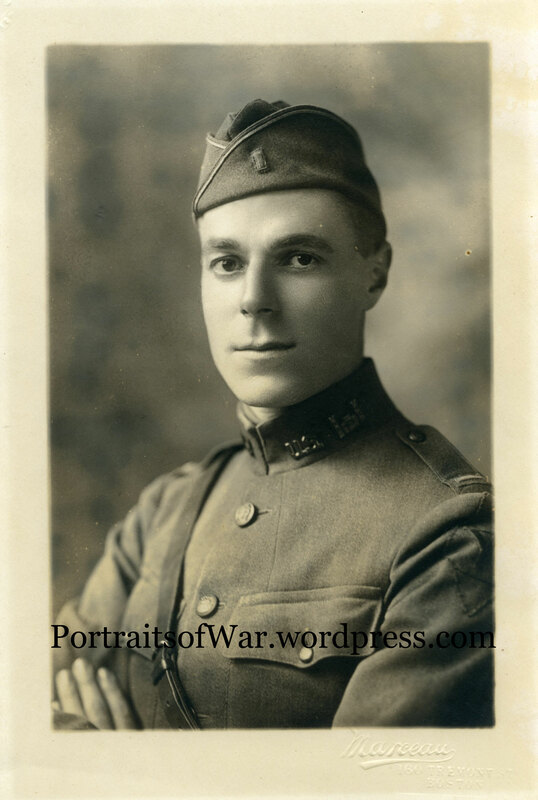 However, he is also apparently a newly-minted Captain in the 32nd Division as indicated by his sporting of the double 1st Lt bars on his shoulder along with the 32nd Division shoulder patch. 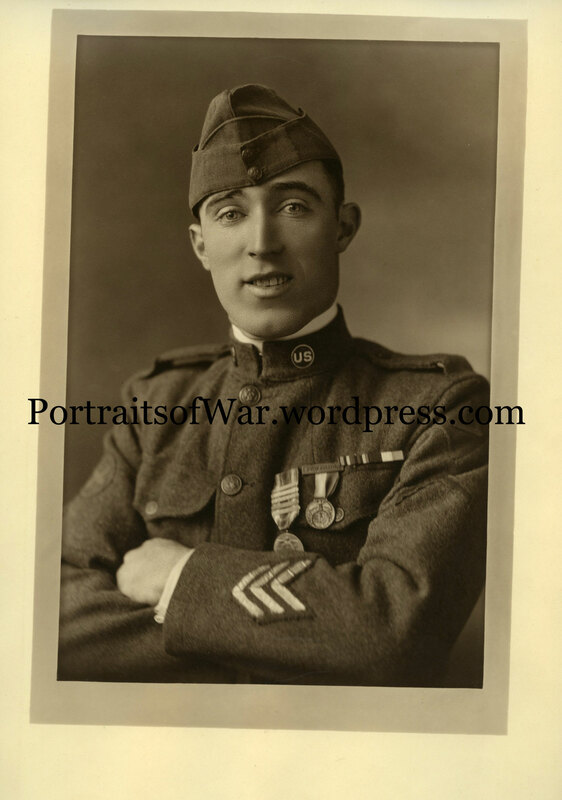 I believe he was originally a 1st Lt in the 103rd Infantry, and then accepted a promotion in rank to extend his service in Army of Occupation with the 32nd Division. Thanks again to Soldier’s Mail! Yet another 26th Division photo to share with all my followers. 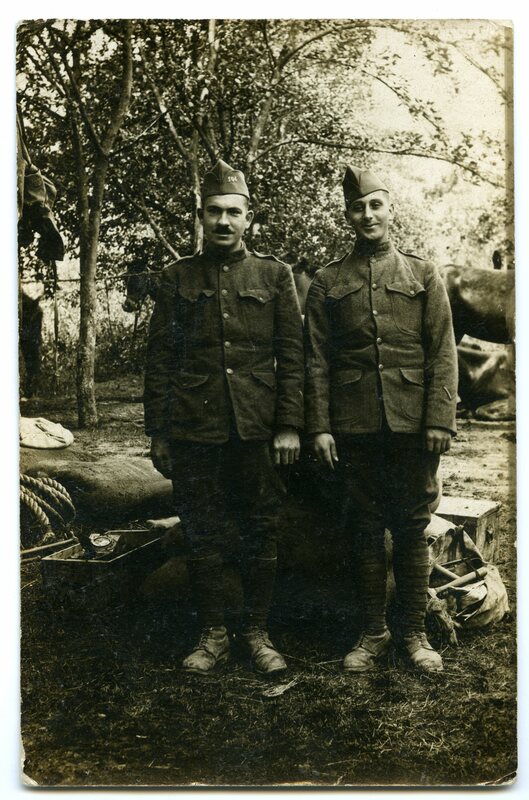 This image was taken in France towards the end of 1918 and shows two doughboys of the 104th Infantry Regiment posing for the camera with unit designation pinned to their French made caps. An interesting addition to my growing collection of Yankee doughboys! Welcome to Portraits of War! After years of collecting WWI and WWII photography, I’ve finally decided to share some of my favorite images with the world. 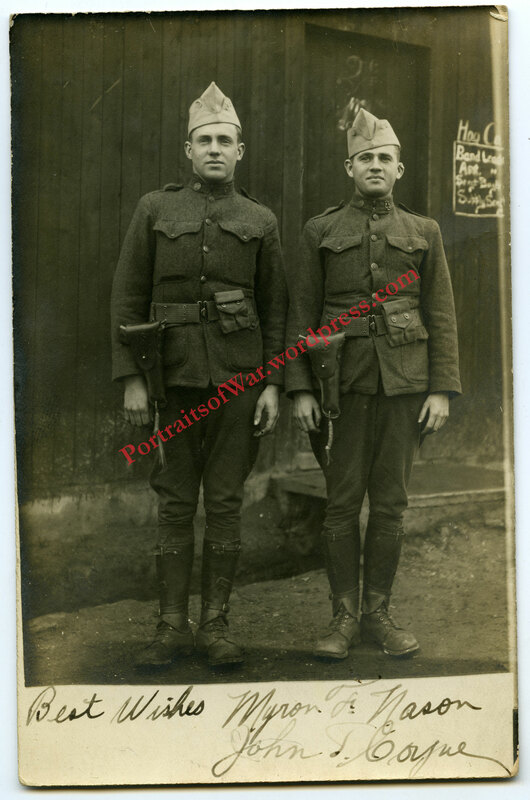 I’ve searched through flea markets, antique stores, and eBay auctions to obtain photos depicting American soldiers in various world conflicts. Lets jump into the dissection and interpretation of one of my favorite WWI images and see how history was recorded through the lens of a photographers camera. 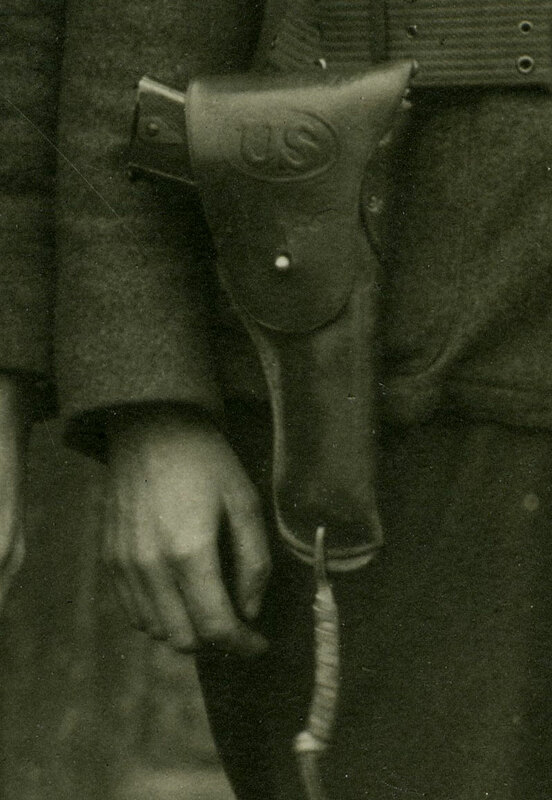 The first thing I always look for when buying a good WWI photo is the general “eye appeal” of the image. Is the subject well lit? Did the photographer take time to seat and position the subject? How good is the contrast and detail? All these things are sometimes unable to be determined when making internet based purchases, but it never hurts to ask the seller for a better scan. Condition is also a big factor when I make a “higher end” purchase in eBay. I consider $50+ the threshold between medium range and higher end purchases. In terms of aesthetics, this photo has it all going on. The contrast and detail are perfect, the condition of the image is superb, and the price was right at $26.50. Because the purchase was an eBay auction win, I wasn’t able to ascertain the historical details until I had the photo in-hand. 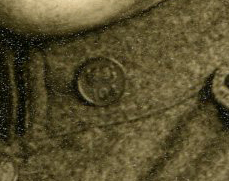 The first and easiest way to identify the unit designation of a WWI soldier portrait is to inspect the shoulder sleeve insignia also known as an SSI, or in layman’s terms, a shoulder patch. In this case, we see a YD on a diamond on the subjects arm. My favorite WWI division has to be the 26th “Yankee Division” – made up of primarily New England soldiers who took the call to the National Guard units early on in America’s involvement in WWI. These New England National Guard units were eventually combined together to form the 26th Division and were later bolstered by fresh recruits from replacement units while stationed in France. How can we tell when this fellow joined the war? 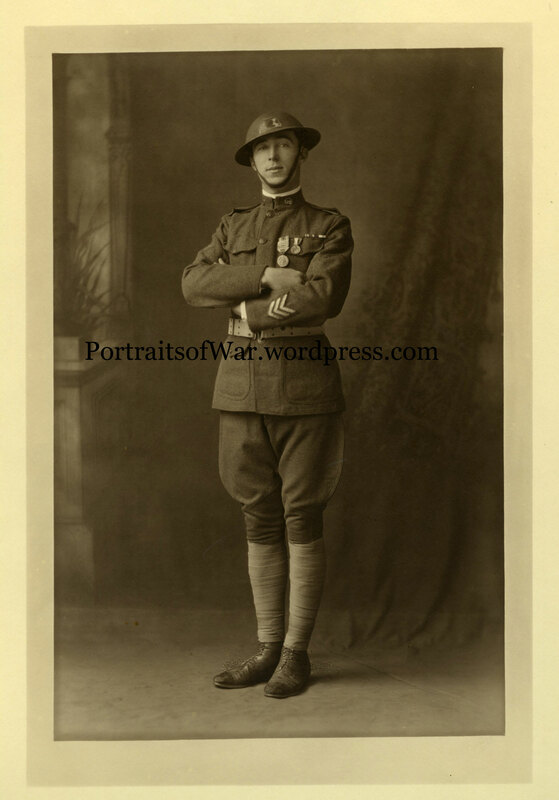 Although the date of the photo is unknown, we can ascertain that he served at least 12 months overseas. 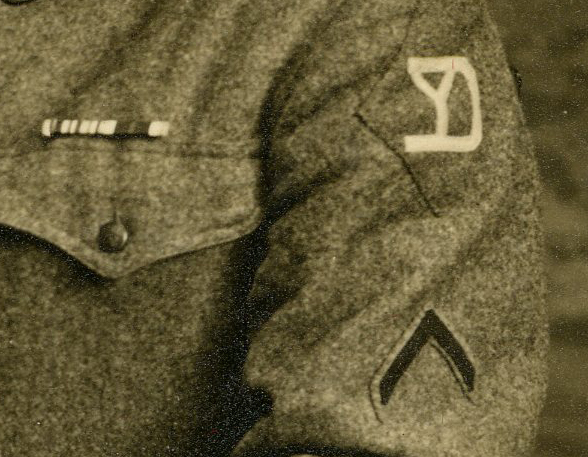 The two chevrons on his left arm mark him as having served for two 6 month periods. The photo was likely taken right after his return to the states, which is denoted by the dark colored chevron below his SSI (patch – remember?). This guy was wounded twice during the war. The double chevrons on his right arm were earned for being wounded. He has no obvious battle scars on his face or hands, and he appears to have both his legs, so I am assuming that his wounds didn’t force his discharge. 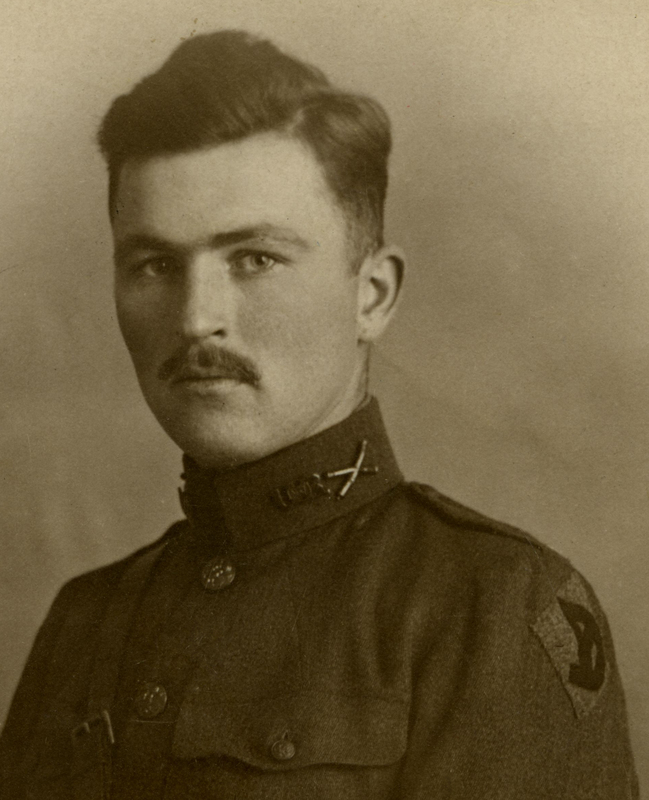 Most 26th Division doughboys (an endearing term used for WWI American soldiers) served at least 18 months – so this veteran likely came in as a replacement to help fill the slowly depleting ranks of the division.